Looking for something different to do for a birthday? 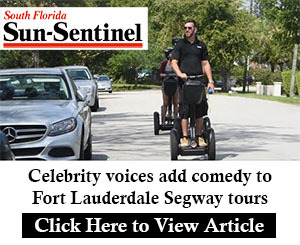 Maybe a team building event in South Florida that would call for a few Segways? We have you covered with up to seven Segways for a private party or event. Since Florida Statute 316.2068 allows us to ride in any 25 mph speed zone, any sidewalk, and any bike path, many people like to exercise these laws and ride around their neighborhood or local park.